Civilization is an instrument fashioned by human beings to improve the welfare and well-being of our race through a wide range of institutions — political, social, economic, educational, scientific and cultural. When Adam Smith published the Wealth of Nations at the onset of the Industrial Revolution, it appeared as if a solution had finally been found to the age-old problem of scarcity. This was also a time when physical science began to uncover the laws governing the marvels of nature. It was natural and, perhaps, inevitable that early economic thinkers looked for similar laws governing society and gave inordinate importance to the system of industrial economy, since it appeared to offer enormous promise at the time. In the process they lost sight of the greater truth that, unlike the systems governing the physical universe, social systems are created by human beings for the benefit of humanity and their validity must be judged solely on the basis of their contribution to human welfare and well-being. Current economic theory has been constructed on a foundation laid more than 200 years ago. Since then, and especially in the past half century, monumental changes have radically altered the structure and functioning of economies, to such an extent that they call into question many of the valid premises on which earlier theory was based. Among these, the evolution from a production to a service-based economic system, the growing predominance of public policy in economy, the globalization of production and markets, dramatic changes in the nature and role of money and financial markets, and fundamental changes in social aspirations and social values are especially relevant. It is now evident that economic theory cannot be separated or divorced from other aspects of human existence — political, social, ecological, technological, cultural, etc. — and that none can be validly considered without giving central importance to their impact on human welfare and well-being. In recognition of these facts, the idea of rethinking economics has been gaining support. Late last year, a small, multidisciplinary group of individuals with membership in the World Academy of Art & Science and the Club of Rome began a fresh examination of current economic theory to examine why the basic premises of classical theory were adopted in the first place, to understand where and why they have failed or are no longer adequate to meet the needs of the 21st century, and to consider the feasibility of evolving a more effective theoretical basis for the future. This article sets forth the rationale and justification for a re-evaluation of the fundamental concepts and premises of modern economic theory with the goal of evolving a truly human-centered theory and practice. The recent global financial crisis is only the latest in a host of significant factors that call into question the efficacy and sufficiency of contemporary economic theory. That so many distinguished economists, central bankers and policy-makers wielding sophisticated concepts and models failed to anticipate impending catastrophe is characteristic of mass hypnosis. How else to explain such a broad-based failure to comprehend issues so vital to the security, stability and progress of human civilization? A single crisis might be an error or statistical aberration, but the events of the past few years are part of a larger trend. Since the early 1970s, national and global markets have become increasingly unstable. Beginning in Latin America, an accelerating succession of financial crises have plagued developing countries (1982), Mexico (1984), the USA (1985), Japan (1988), Western Europe (1992), Asia (1987), Russia (1998), and now the entire global system. Nor is financial instability the only problem. Simultaneously, the world economy has been unable to generate sufficient employment opportunities to meet the needs of a burgeoning population, leaving a record 212 million people without jobs according to official ILO figures, which grossly underestimate actual unemployment and underemployment worldwide. During the same period, growth rates in OECD countries have declined dramatically.1 Meanwhile, in spite of decades of economic development, today the poorest 40% of the world’s population accounts for a mere 5% of global income, while the richest 20% accounts for three-quarters of world income.2 More than three billion people live on incomes of less than $2.50 a day. More than 80% of the world’s population lives in countries where income differentials are widening.3 Global financial assets of the wealthy have multiplied exponentially, from $12 trillion in 1980 to $167 trillion in 2006. Income inequality continues to grow, frustrating the rising expectations of the world’s poor, and increasing the propensity for social unrest, crime and violence. Why blame economic theory for the world’s myriad disorders? The very purpose of social theory is to provide us with the knowledge and capacity to solve problems and optimize the well-being of the human race. A theory that fails to predict or provide a clear path for meeting human needs has to be considered either inadequate or failed. The economic theory and measures of value posited by classical and neo-classical economists were bound to the premise that manufacturing systems would be the dominant source of future wealth creation. Measuring increases in the monetary value of output was deemed an adequate measure of increasing wealth. Since then there has been a fundamental change in the way wealth is produced. In the 20th century the manufacture of tools and products was gradually supplanted by an economic system increasingly dependent on scientific research, technological advancement and education, giving rise eventually to the modern service economy in which services account for 64% of global output and more than 70% of employment in OECD countries.5 These figures underestimate the contribution of services since in many cases they fail to take into account service functions and employment within manufacturing industries, because of the explosion of services required to raise productivity, such as storage, distribution, publicity, logistics, marketing, organization, financial systems, and recycling. For example, the cost of producing a banana represents only five percent of its sale price. For an automobile, it represents 20 to 25%. This shift to a service economy necessitates a fundamental change in the way value is measured. In addition, today the world suffers from excess production capacity backed by insufficient purchasing power. Increasing production capacity is no longer a sufficient premise for wealth generation. Smith wrote in an age of nationalism and his economic conception is based on a competitive model of how one nation can gain advantage and dominance over others. The nation-state is only a part of global society. What works for the part does not necessarily work for the world economy as a whole, e.g. the export-driven strategy of East Asian economies and now China cannot be replicated by all nations globally. In spite of the fact that we live in an increasingly globalized economy where exports represent 20-25% of global world product, modern economic theory is still modeled on the premise of the nation-state as the basic unit and on concepts designed to maintain competitive advantage over other nations, to maximize domestic rather than global employment and domestic rather than global prosperity. Yet, according to the US intelligence community, by 2025 a single international community composed of nation-states will no longer exist.6 Larger agglomerations are in the offing. We urgently require an inclusive theory that is valid for the whole world economy and will maximize benefits for all humanity. No longer can we justify economic principles that support the success of the few over the many. There is need for new theory that achieves maximum economic security, wealth and welfare for all. Economy exists on a substratum of ecology and as an integral part of a wider social context. The failure of contemporary economics to adequately account for ecological factors is well-known. Current measures of wealth creation such as gross national product fail to distinguish between activities that drastically deplete natural capital and those which protect or enhance the environment. In addition, recent actions of national governments to stem the global financial crisis reinforce the obvious fact that economics is inseparable from politics and that both are inseparable from social and psychological processes. Political Economy, which was born as a subset of Political Science, acquired its present shape during a century in which social science was compartmentalized and fragmented into so many different airtight compartments that are inadequate to accurately represent the complex interactions and integration which constitutes the united social life of humanity. New economic theory in particular and social theory in general are needed to bridge these gaps and arrive at a more synthetic conception. In view of these various factors, it is not surprising to find an increasing number of economists and others calling for radically new thinking in economics. Last year Nobel laureates Joseph Stiglitz and George Akerlof published an article calling for “A New Economics in an Imperfect World”.7 George Soros established an Initiative for New Economic Thinking (Inet) at the Central European University in Budapest. David Korten of the Club of Rome published a book entitled Agenda for a New Economy: From Phantom Wealth to Real Wealth and founded a new economy working group. Physicist J. P. Bouchaud challenged dogma regarding the efficacy of free markets, calling for a scientific revolution in Economics.8 Of course, fundamental challenges to the principles and perspectives of modern economics are not new. In the 1970s, Nicholas Georgescu-Roegen, a Romanian-born economist, began to remodel economy as a living system.9 Even prior to the Great Crash and Depression, Nobel laureate chemist Frederick Soddy roundly criticized prevailing theory and called for a radical restructuring of global monetary relationships.10 In this article, the authors examine some of the central issues in economics which require rethinking and pose a number of fundamental questions for further consideration. Natural scientists since the age of Newton have sought to discover the underlying laws that govern the physical universe. Their phenomenal success over the past few centuries ignited a similar hope among social thinkers of identifying similar principles underlying the governance of human society as well. In doing so, science overlooked an obvious difference between human and physical systems. We may never fully understand how or why the physical universe and its laws came into being, but when it comes to human systems there is no mystery about their origin. Physical nature may be governed by impersonal, immutable formulas and physical constants, but human systems are the product of ideas, aspirations, values, understanding, opinions, decisions, and attitudes which evolve over time. The life of humanity is a product of the social organizations and institutions we have fashioned in the course of social evolution, which in turn have been determined by our limited understanding (ignorance), egoistic attitudes and insufficient will to arrive at a more adequate solution. It is the result of human choices made in the past, choices that can be altered at any time. They are intended to promote human welfare and well-being, whether of a small dominant minority or of humanity as a whole. Perhaps because of the uncentralized complexity of economic systems and the myths and mystery surrounding the creation of money, all too often economists have lost sight of the obvious fact that economic systems are created by human beings for the sake of human beings, and sought instead to discover universal, impersonal laws that determine how economic systems function. Today’s economy moves at the speed of thought, but our thoughts about economy are still mired in concepts of a Newtonian world view. A report to the Club of Rome entitled The Employment Dilemma: The Future of Work challenges the classical conception of economics: as a “system of models in the deterministic tradition of Newton’s world as autonomous, closed, self-regulating universe, running according to predetermined laws, culminating in a static equilibrium...”.12 They argue, classical and neo-classical economic theory incorrectly focus on the central importance of supply and demand, rather than on the central importance of human welfare. In an effort to imitate the impartiality and objectivity of the physical sciences, social scientists have generally chosen to study existing social systems as they are, rather than formulate theories describing what they should be. There may be no place for ethics in physical nature, but a sense of right, truth and justice is the very essence of what makes us human. The divorce between traditional economic knowledge and evolving human values lies at the heart of the problem with contemporary economic models which regard financial markets as a law unto themselves, without considering their appropriate role in the economic welfare of society. Consequently, financial markets, which were originally established to serve as a stimulus to economic development, have now acquired an independent status of their own and function in a manner that jeopardizes the very economy they were intended to support. They have opened the door to the possibility of indiscriminate money and debt creation unrelated to either the economy or human welfare. The same error applies to economy. Society is the whole of which economy is a part. Economy is the whole of which money, markets and employment are parts. Economics is one aspect of human life, one contributing factor to human welfare and well-being. When monetary systems are regarded as things in themselves and ends in themselves, they produce aberrations that not only threaten the underlying economy which they are intended to serve, but the entire society of which economy is merely a part. The need for new theory is self-evident when we recognize that neither classical nor contemporary theory provides an adequate solution to the most central issue of economics. The goal of economic systems is the generation of wealth to promote human welfare, not financial speculation. The assertion that the laws of economics make it necessary for some people to remain unemployed in order to ensure employment for the majority or that gross inequalities in the distribution of incomes and wealth are natural and inevitable is to mistake historical injustice for eternal truth. Just as the world has discarded the exclusive, discriminatory political principles of monarchy and colonialism in favor of democratic principles of freedom and equality, economic systems can and must evolve in conformity with universal human values to meet the needs of the entire human community. We human beings make the laws that govern economy as well as polity. If we do not like them, we have the power to change them. We are in an era in which the challenge is to find the best optimal and complementary combination of private and public. For instance, state intervention in the Swiss pension system, arguably the best in the world, makes possible an active role for complementary private institutions. New theory needs to address fundamental questions. What theoretical framework will lead to a system that optimizes the generation of real wealth? How will its principles reflect the primacy of human choice and human welfare? How will it effectively and justly reconcile the rights of the individual with the overall welfare of the social collective and humanity as a whole? In formulating a new theory of employment, it is both good sense and good ethics to start with the premise that any system which purports to represent sound economics must provide a viable means for all members of society to acquire at least the minimum (why not the optimum?) level of purchasing power needed for survival, development and full enjoyment of their human potential. If economic systems based on current theory are unable to provide sufficient employment opportunities, it means either the prevailing theory or its application is deficient. Since the problem of unemployment is so widespread, we may safely assume the fault lies in the theory itself, as this conditions adequate practical applications. The failure of theory is self-evident, but most social thinkers — Marx is an obvious exception — have been constrained from evolving alternatives. There are only two possible solutions to the problem of human welfare. Either all members of society must have ample opportunity to acquire the good things of life by their own enterprise. Or in the absence of such opportunities, society must provide adequate support for all its members in the form of social welfare benefits. Anything less than this can only be considered a first rough approximation, a crude clumsy attempt at social development in need of radical reform. Obviously, there is a great deal of work that is not getting done in the world, work that would raise the other half of humanity to middle class status. Apart from this, humanity has an insatiable appetite for more education at all levels, improved health care, more and better attention to the needs of children and the aged, better community development, more research, new forms of entertainment, infrastructure improvements, etc. So we have a vastly underutilized resource — human beings — estimated by Randall Wray as 17.5% of the work force in the USA alone, and we have a plethora of unmet social needs.16 Incidentally, Wray also argues that the social costs of high unemployment in terms of loss of human capital, poverty, social isolation, crime, regional deterioration, health issues, family breakdown, school dropouts, social, political and economic instability, violence, ethnic hostility, and even terrorism far outweigh the cost of public jobs program to achieve full employment. But long term, there should be and is a better way than public jobs programs. That requires formulation of new theory, not just modification of prevailing concepts. There is no reason why we should not formulate a theory of economics based on the premise that all members of society have a right to employment, a theory that not only affirms the right but also presents the structures and processes by which this can be achieved. During Smith’s time, production was largely dependent on labor and, therefore, economic growth might be largely synonymous with growth of employment opportunities and incomes. This is no longer true. Today technological development makes it possible to multiply production and expand economically with less human labor, challenging society to find ways to redistribute the privilege and benefits associated with employment to cover all its members, which is a question of social engineering. In addition, employment markets are no longer national. The globalization of production by MNCs makes it possible to source goods from anywhere in the world. Outsourcing is doing the same for many types of services. But regulation and economic policies to maximize employment are still confined to the national level. Our employment models and policies are nation-centric. How will the new economics reconcile global labor markets with national-level employment policies? So long as employment remains the principal means by which people acquire the money needed for the goods and services they need for survival and welfare, the growing separation between production and employment will spell increasing hardship and catastrophe. How will the new economics reconcile optimal efficiency of production with full employment? What place is there in a human-centered economics for theory based on the premise that employment is a natural right which must be guaranteed? How can such a right be assured without problems of moral hazard? New theory needs also to look to a future time when the evolution of the global production system may make it possible for a relative small portion of the world’s population to provide for the needs of all human beings. What then will be the role of employment in ensuring equitable distribution of incomes? Although money is the foundation of modern economics and economy, it is remarkable that more attention is not given to what money actually is, as if the answer to the question were too obvious to merit serious discussion. Without a clear conception of money and wealth, no economic theory can attain comprehensive preciseness. Economists commonly define the functions of money and central bankers define a variety of measures for money, but that is very different from defining the thing itself, assuming money is a ‘thing’, which takes us to the heart of the issue and one of the commonest misconceptions about money. Money is not a ‘thing’; it is a symbol, an energy, a force, a social organization and a power for accomplishment. The history of money attributes the origin of coins to ancient Lydia and China and traces the earliest forms of banking and paper currency in ancient Egypt — the receipts issued for grain deposited in state warehouses, marking the evolution of money from a physical thing to a symbol with no intrinsic value of its own. Initially related to the mining of precious metals or the production of food grains, money gradually evolved into a social system to measure the store of value, increasingly distinct from the things it was used to produce. Like language, money is a system or organization for fostering relationships between human beings. Thus, money developed in parallel with the development of trade. The role of money as a medium of exchange in trade marked the second important stage of its development. Instead of people generating wealth by production on the land, they learned to do so by exchanging goods and services with others in the marketplace. The center for wealth-creation shifted from production to the market, from physical work to human relationships. Each commercial transaction created additional profit for the trader as well as additional trust that could be converted into credit for further exchanges. The multiplication of trade based on credit multiplied money and led to the rise of merchant banking in Italy during the late Middle Ages. Thus, mutually beneficial human relationships became the primary basis for wealth generation. Through this process, money came to represent the capacity to get any type of work done — to maintain an army, trade in goods and services, acquire political power, even religious indulgences. In a word, money came to represent social capacity or social power. The rise of banking and central banking marked the transition to a third stage in which money evolved into a complex social organization closely linked to the centralization of political power, forming the basis for emergence of the modern nation-state. It is remarkable to note that the failure of the Roman Empire 1000 years earlier to discover the power of the state to create money by borrowing from the public was one of the principal reasons for its collapse. The empire died of bankruptcy without owing money to anyone. The nation-state was born when central banks began to organize public debt. New economic theory needs to redefine our concepts to fully reflect both the potential and actual power represented by human knowledge and skills, social and technological capacities, organizational expertise and political institutions, cultural values and attitudes that constitute the bedrock of wealth, welfare and well-being. Money is created by social activity, by movement. Advances in social development accelerate and multiply social movements, thereby enhancing society’s capacity to accomplish work and generate wealth. Money and wealth are created by faster communication and transportation, better education and health, improved technology, advanced systems and management expertise, a more peaceful and stable social environment, greater tolerance and harmony, higher levels of trust and reliability. Economic theory needs to take into account the precise relationship between money, economy, civilization and culture. The confusion regarding money and wealth has immense practical consequences. It leads to the pursuit of financial activity as an end in itself, divorced and even opposed to economic well-being and human welfare. Today, trillions of dollars circle the globe every day in pursuit of higher speculative profits, 95% of it unrelated or negatively related to any real contribution to society. Unthinkingly accepted as inherently beneficial or economically indispensable until crisis strikes— Nobel prizes have been awarded for developing more effective computerized trading systems for speculation — we rarely stop to recall the original and essential role of financial activity or to consider the negative implications of unbridled speculation. David Korten reminds us of the original purpose of money and financial markets. “From the standpoint of society, money is properly treated as a means, not an end. Rather than directing money to financial speculators and scam artists devoted to creating phantom wealth for personal gain, we must create proper official money systems designed to effectively link underutilized resources to unmet needs to improve the health of our children, families, communities, and the natural environment.”20 He implies that an essential deviation has occurred by which the means or instrument (financial transactions) has become an end in itself. This is not only true of money. It can happen with technology, education, government and any other human institution or activity. Dialogue on Wealth and Welfare reminds us that like other made-made powerful tools, financial capital formation can be either positive or negative, depending on the values it is used to express. “The production of powerful tools is one thing, but the definition of their goals and their positive utilization is a matter of human choice and responsibility.”21 If money is a means and not an end, what purpose was it intended to serve? What purpose is it serving now? What has changed, how and why? Korten says money systems should be designed “to effectively link underutilized resources to unmet needs to improve the health of our children, families, communities, and the natural environment.” Is this the true role of money? How far is money playing that role? Where and how does it fail? Is the problem fundamental to the type of money we have today or is it a distortion that can be rectified by modifying the system? Korten goes even further to condemn bank-generated money and makes a distinction between phantom money and real money. When $50 trillion global financial assets disappeared in 2008, it is natural to wonder whether that wealth was ever truly real, and, if so, where it has gone?22 The fact that a momentary collapse of public trust and confidence can destroy real wealth of that magnitude, points to the necessity of redefining money and wealth to highlight its sociological and psychological underpinnings. A clearer conception of money is essential to answer these and related questions. It will also enable us to properly consider other forms of money that are not created by banks or national governments. At the height of the Great Depression, an experimental currency introduced in the town of Woergl, Austria wiped out 30% local unemployment in a short time. Today more than 2500 complementary or local currencies are being utilized by communities, NGOs and corporates to compensate for the inadequacies of national money systems, often with remarkable effectiveness. As we write a plethora of non-national money systems are gaining currency on the Internet. Yet, mainstream economic theory does not adequately account for the capacity of these supplementary systems to harness unutilized resources to provide for unmet social needs. Nor does it help us assess the ultimate potential for creating innovative monetary systems. Classical economics was founded on the idea of the nation-state as the basic unit of economic activity. In contrast, today’s service economy has to be thought of as a global process involving the whole world economy. It is not an add-on to the Industrial Revolution, but rather a subsequent phase in the evolution of the global economy. That integration spans the globe in agriculture, manufacturing, financial services and even retail. As the recent financial crisis illustrates, many traditional concepts and policy options are no longer relevant. Modern technology has, in most cases, greatly reduced manufacturing costs, while increasing the cost of services associated with both production and utilization. As in manufacturing, the service economy also depends on the manufacture of products and tools needed for service delivery. There is no service without products anymore than there can be products without services: simply the ratio between the two types of activity has reversed in the contemporary service economy. Therefore, it is also subject to the constraints related to non-renewable energy and material resources; but, in services, the human resource becomes by far the most important resource and the quality of that resource has a profound impact on service delivery and quality. Knowledge, skill, values, attitudes, managerial and organizational capabilities determine the quality and productivity of the human resource. Continuous development of people in terms of higher levels of knowledge and skill becomes the most essential strategy to support continuous growth of the service economy. Every science requires effective measures for evaluation of results. The evolution of the service economy has profound implications on economic theory for it calls into question our very conception of wealth and the way economic value is measured. The Industrial Revolution gave rise to measures of the increase in the economic value of the flow of production through various stages of manufacture, assuming that the production process was complete the moment a product or tool was available for sale on the market and that all costs associated with its manufacture contributed positively to wealth-creation. Thus, gross national product emerged as a standard measure for production and wealth-generation in a monetarized, manufacturing-based economy. Limits to Certainty enumerates several ways in which the predominance of services alters the fundamental notions of economic value on several counts.28 First is the problem of risk. Traditionally economists have spoken about ‘use’ with reference to the application for which the product is intended after sale and ‘cost’ with reference to the stages of production and distribution up to the point of final sale. In contrast, services are delivered over a period of time and the full cost of delivery usually cannot be assessed at any single moment, before or after the sale. The real value of products and services is concerned with the period of utilization, which contain new uncertainties that cannot be fully assessed at the time of service delivery. The development of telecommunications, of banking and financial services, of insurance, of maintenance and engineering, cannot be accounted for in terms of their being merely new kinds of “production”, extensions of what had already occurred in textiles, iron and steel and the chemical industry. Selling a product (i.e. a machine) once (i.e. at a given moment in time) is a different business from fulfilling a maintenance contract over an extended period of time, during which the seller remains contractually committed to the consumer for the utilization of the “product”. Even within the service sector, significant differences exist with regard to valuation, e.g. differences between banking and insurance. For these reasons, static, deterministic notions of value as representing by the equilibrium between supply and demand no longer apply. Thus the valuing of services involves new types of entrepreneurial and commercial risk and far greater degrees of complexity, vulnerability and uncertainty. Value in the new economy is probabilistic, rather than deterministic. The problem of value is further aggravated by the dramatic shift in emphasis from quantity to quality, which has characterized the evolution of the service economy. The majority of human beings are no longer concerned with having sufficient food, clothing and shelter for their very survival. The growth of the service economy signifies an advance beyond subsistence levels of existence. What were considered luxuries a century ago are now considered necessities of life that have significantly enhanced human welfare. Even during the 1930s, unemployed Americans were seen driving to soup kitchens by automobile. Motor vehicles, telephones and televisions can be found even in the poorest regions of developing countries. Education, social security, medical care, insurance, travel, mobile phones and entertainment have become essential primary goods for the vast majority. Indeed, the service economy is continuously giving rise to new services to meet higher human aspirations and provide greater fulfillment and enjoyment. This qualitative improvement extends not only to the range of products and services but to their quality as well. The automobile today is very different from the Model T Henry Ford built a century ago as the ‘car for the common man’. The average educational level of the population as well as the quality of education have risen enormously. Only one PhD was awarded in the entire US in 1880. Today, more than 50,000 are awarded annually. Improvements in health and medical care are only crudely reflected by statistics on life expectancy. People today are not only living longer; they are healthier, more active, energetic, and comfortable than any previous generations. The Internet is perhaps the most impressive illustration of this remarkable qualitative change in human life. Never before have people around the world had free or very low cost access to such a wide range of information, communication, products, education, entertainment and the capacity to reach out to other human beings. All of these factors pose serious challenges to economic theory. In combination they indicate that current measures of production, living standards and wealth are grossly distorted. They severely underestimate real costs as well as real benefits in terms of human welfare. New measures based on new theory are absolutely essential for charting an effective course for humanity’s future prosperity. Inadequate production capacity combined in Smith’s day with severe shortages of land and most raw materials, leading Malthus to postulate that population growth would soon outstrip food production. Smith formulated the Wealth of Nations during an age of scarcity, just a year after the invention of the steam engine, when food, clothing and virtually all other economic goods were in short supply. Social thinkers of his age believed that a combination of mechanization, specialization and division of labor, and free markets would finally solve the problem of scarcity. In spite of this remarkable achievement, the problem of scarcity and poverty were not fully resolved. From the beginning of the Industrial Revolution until the 1920s, it was generally believed that any increase in production would be absorbed by the market. Then a situation emerged in which there was insufficient money to purchase all that was produced. Only later did economists come to understand the importance of solvable demand. This led Keynes and other economists to turn their attention from the problem of supply to the problem of creating sufficient demand to distribute the ever increasing production capacity. Keynes concluded that generation of debt was acceptable, provided it was used to absorb production that could otherwise not be absorbed, but warned against generating debt beyond this level, although his name has been used in recent decades to justify any level of debt. The key reference was demand. In the process, economists lost sight of the complex structural changes taking place on the supply system, most especially with the evolution of the service economy. Today the global spread of production capabilities and the globalization of trade make it possible for one or few companies or countries to produce the entire world’s requirement of many products. Together they support a global population of more than 6.5 billion, half of them at middle class living standards. Yet at the same time widespread poverty linked to high levels of unemployment and underemployment are glaring reminders that economic theory and practice remain incomplete. The problem arises because production and consumption have been dealt with theoretically as if they are independent functions linked by the mechanism of market, rather than two complementary aspects of a single, integrated whole which is economy. Market is, no doubt, a remarkable mechanism, which has done admirable service to humanity. But left to itself, it often leads to conspicuous waste and obvious failures. Unregulated markets give rise to an economy of excess production capacity and periodic overproduction, resulting in economic instability, bankruptcies, wastage and massive dislocation of workers. Today excess production capacity in combination with distribution and maintenance costs is a serious threat to economic stability and growth. Moreover, the globalization of production makes it increasingly difficult to manage or regulate production to mitigate the problem, since information systems and controls are still largely confined to the national level. Smith’s economics was based on the capacity of the market to arrive at a natural equilibrium. But as in the case of monopolistic constraints on supply, overproduction can generate conditions in which the equilibrium state generated by the market is far from optimal for wealth generation and human welfare. Highly effective as a mechanism to mitigate unbridled human greed, market is poorly qualified to promote true justice and equity. As we will discuss later, without equitable distribution, the economic problem can never be fully and satisfactorily resolved. New economic theory has to supplant the 18th century notion of self-regulating local and national markets with sound principles for effective regulation of an increasingly integrated, single global market. It needs to place human welfare and well-being at the center and regard production, consumption and markets as means to serve this central human objective, rather than as ends in themselves. The central theoretical issue is how to integrate production and consumption within a comprehensive framework. New theory needs to answer questions such as: How can global production be effectively balanced for economic stability to maximize the fulfillment of human needs? What should be the governing principles and mechanisms for balancing supply and demand in the new economics? What will new economic theory postulate regarding the potential future prosperity of humanity? The history of human progress over the past two centuries has been characterized by increasing equality in terms of political and social rights, freedom, voting rights, universal education, etc. For decades, development economists and social leaders have condemned on ethical grounds the blatant and growing inequalities between rich and poor within and between nations. In response, what is morally unjustifiable has been justified economically as materially beneficial to the welfare of society. The justification of economic inequality is inconsistent with the abundant evidence that the extension of benefits to lower sections of the population is both beneficial and essential for the maximum welfare of society as a whole. In a recent book, Richard Wilkinson and Kate Pickett cite solid evidence to show that more inequality results in shorter life expectancy, more health problems, less trust, more crimes, etc.32 A new economics has to take into account the role of equity and inequality in terms of both ethics and social welfare. What is the true place of equity in economics and human life? Freedom and equality are complementary values. Yet since the demise of communism, economic theory has swung back in favor of an extreme form of unregulated wealth-creation leading to rising inequalities. A new economics should examine the rightful role and reconciliation of these complementary values. The problem of equity is also inextricably bound to ecological issues and the notion of sustainability. On a global basis, equity implies equal right to the resources of the planet. On a time scale, it implies equal right of future generations to welfare and well-being. For both reasons we are compelled to consider the longer term impact of current economic activity and ensure the sustainability of whatever model we endorse. Nor can valid economic theory be isolated or divorced from concerns regarding political and social stability. The principles of a new economics must take into account the wider goals of social stability and human welfare, not just the narrower goals of wealth generation by producers. Evidence abounds that growing inequality between communities and nations rather than absolute levels of poverty is the principal cause for terrorism and rising social unrest in the developing world. Lack of employment opportunities is believed to be a significant factor in the propensity of youth to join terrorist movements. According to the US National Intelligence Council, “unless employment conditions change dramatically in parlous youth-bulge states such as Afghanistan, Nigeria, Pakistan, and Yemen, these countries will remain ripe for continued instability and state failure.”33 The same is true of the poor and unemployed in China, India and other developing countries. India’s introduction of a National Rural Employment Guarantee Scheme in 2005, which now provides 100 days of assured employment to more than 45 million families, is based on rising concern over growing inequality. The instinct for survival combined with limited opportunities and frustrated expectations is easily transmuted by aspiring leaders into an aggressive attitude that generates real threats to social stability at the local, national, regional and global level. Economics is concerned with the process of increasing the capacity of society to attain higher standards of living. But economic activity takes place in an ever-changing, ever-evolving context. Society is constantly generating new ideas, new needs, new technologies, new products, higher aspirations, growing expectations, higher levels of productive capacity, more complex organizations, and, as a result, higher levels of material security and enjoyment. Social development is a complex social process that involves political, social, psychological, technological, organizational, cultural and ecological factors. Our ideas, understanding, perceptions, social attitudes, psychological aspirations and cultural values are crucial determinants of this process. Ultimately a new economics must be founded upon and consistent with an underlying theory of social development applicable to human progress in all fields of activity. While in principle the social sciences can be neatly divided into distinct disciplines, in practice, economics, politics, sociology and psychology are inseparable dimensions of a single, integral reality called society. The impact of public policy on economy is dramatically illustrated by recent efforts of governments around the world to cope with the financial crisis by modification in interest rates, capital margins, government spending on stimulus packages, job creation programs, tax rates and incentives, regulation of financial institutions and international financial transactions. These are in addition to the normal application of public policy instruments for controlling inflation, securities trading, determining minimum wage rates, underwriting housing finance, unemployment insurance and welfare benefits, investment in infrastructure development and other public works, control of exchange rates and management of the public debt. Beyond this, virtually every area and aspect of modern economic life is governed by laws and procedures relating to product quality, safety, public health, zoning, licensing, emission standards, land and water pollution, recycling, and so forth. The modern market economy was a natural outgrowth of the rise of liberalism and political democracy in the West. The extension of freedom and democratic rights to every citizen has gradually led to the emergence of economic democracy as well, in which each individual casts monetary votes according to his individual needs and capacity. In the absence of basic human rights, economic life as we know it today is inconceivable. The increasing prosperity of humanity is predicated upon the rising value according to each human being. The inextricable linkage between economics and polity is illustrated by the severe debt problem in Greece, Spain and Portugal, as a consequence of the global financial crisis. Paul Krugman argues that economic and political integration are both moving forward among the members of the EU and Euro zone, but at different speeds and to different degrees. Having joined the Euro, these countries are no longer able to regulate domestic interest rates or national exchange rates to offset severe budget deficits because political integration has not gone as far as economic integration. He contrasts this situation with that of states in the USA where federal government spending and high levels of cross-border labor mobility can offset state-level problems in considerable measure.34 Economy and polity are inseparable. The impact of social factors on economy is equally pervasive, though less apparent. Educational and skill levels of the population are primarily determined by social attitudes and organization. Public confidence and expectations regarding the economy and government strongly influence levels of investment, production, and consumption. Rising aspirations provide the energy and dynamism for continuous growth. Social values related to honesty, trust, responsibility and hard work determine the capacity of society to absorb credit. Psychological attitudes regarding risk and entrepreneurship, technological change, employment of women, retirement, freedom, leisure, equality, and authority underpin all aspects of economic behavior. When examined closely, we find that economics is part of an intricately fashioned web of human values, attitudes, decisions, systems and social organizations. Economic growth and social development seem to take place between two poles — one collective, the other individual. Collectively we see that the development of economy occurs within a social macrocosm of public and private organizations, formal and informal institutions related to money, markets, banking, trade, governance, research, education, and so forth. This macrocosm is constantly growing in complexity and expanding in scope from the local and national to the global level. At the other pole is the individual citizen, the single human being, who is also constantly developing and evolving, acquiring greater knowledge and skills, new attitudes and aspirations, higher values and goals, both for personal fulfillment and for the development of the community, nation, world-at-large. Ultimately, economic theory has to be founded on the fundamental process of social evolution as it unfolds in the individual and the collective. New economic theory and understanding must be based on an all-inclusive perspective of society as a whole. An integrated perspective would have to depict not only the full range of factors that determine economic development and performance, but also their interrelationships and interdependencies. All these factors are only various expressions of more fundamental social processes. The foundation of all these processes are principles governing the functioning of the social collective and the role of the individual as leader and member of the collective. We have to also take into account the fact that human systems are constantly evolving consciously or subconsciously in response to new or changing ideas, information, opportunities, challenges, discoveries, attitudes and perceptions. Therefore, our conception must ultimately be based not only on knowledge of the fundamental components but also on knowledge of the process by which they and the systems they constitute grow, develop and evolve. Knowledge of those fundamental processes will give us the power to refashion or evolve the systems to better meet human needs and humanity’s welfare. Formulation of a comprehensive, integrated conception is not sufficient. This conception must have the power to generate positive practical results - to eradicate problems and create opportunities. In social systems, that means we must be able to translate our conceptions into more effective forms of social organization and we must be able to fashion effective strategies to effectuate the transition. 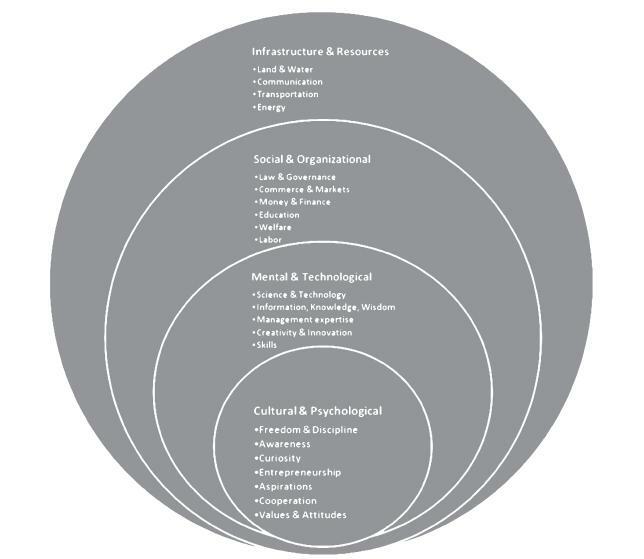 The task of formulating a human-centered science of economics or society is one which will require a multi-disciplinary approach that combines and integrates many perspectives and seeks for a common foundation that synthesizes economic, political, legal, social and psychological factors and processes into a single unifying framework. The authors hope to engage a broad spectrum of their colleagues in the World Academy of Art & Science, Club of Rome and related organizations in this effort. 1. Human-centered: How will a truly human-centered theory reflect the untapped potential for employment generation and wealth-creation inherent in man-made economic systems founded by human beings for the sake of human welfare based on human capabilities and human resources, individual and collective? 2. Economic Value: How will our conception and measures of value take into account the risks and uncertainties prevalent in a modern service economy? How will they incorporate a broader conception of capital in measuring wealth-generation and levels of prosperity? How should it take into account the value of non-monetarized and un-monetized economics activities in measuring wealth? 3. Wealth & Welfare: What theoretical framework will lead to a system that optimizes the generation of real wealth? How will its principles reflect the primacy of human choice and human welfare? How will it effectively and justly reconcile the rights of the individual with the overall welfare of the social collective and humanity as a whole? 4. Human Values: What place will the theory accord to human values in promoting maximum wealth-creation, economic security and welfare for humanity as a whole? How will it take into account the role of equity and inequality in terms of both ethics and social welfare? 5. Employment: How will the new economics reconcile optimal efficiency of production with full employment and global labor markets with national-level employment policies? How will it take into account the essential role of employment in ensuring social stability for the collect and fundamental economic rights for the individual? What place is there in a human-centered theory for the premise that employment is a natural right which must be guaranteed? What conceptual and institutional framework would the theory adopt as the basis for global policies to achieve full employment? 6. Markets: What is the rightful place of regulation in the effective functioning of markets to attain maximum wealth-generation and welfare for society as a whole? How can the untapped productive capacity of the global economy be most effectively leveraged to generate higher living standards and welfare for the world’s population? 7. Money: What is essential basis and backing for money-creation? What role has it played in the evolution of society and economy? What factors determine the ultimate limits to money-creation and how far are they presently being utilized? How can money systems be more effectively utilized to tap unutilized social resources to meet unmet social needs? Which blend of monetarized and non-monetarized activities contributes most positively to wealth-generation and human-welfare? 8. Financial Markets: What is the rightful role of financial markets in promoting wealth-generation and human welfare? What place should regulation and speculation find in an optimal system? 9. Integrated Perspective: What perspective will the theory utilize to reflect the common underlying social processes that connect and integrate economic, political, social, psychological, technological, organizational and ecological factors in the development and evolution of society? 1 ILO, Global Employment Trends 2010, p. 10. 4 Giarini, Orio and Patrick Liedtke, The Employment Dilemma: The Future of Work, Report of the Club Of Rome, 1996, p.114. 6 “Although states will not disappear from the international scene, the relative power of various non-state actors—including businesses, tribes, religious organizations, and even criminal networks—will grow as these groups influence decisions on a widening range of social, economic, and political issues.” National Intelligence Council, Global Trends 2025: A Transformed World, US Government, 2008, p.10. 9 Georgescu-Roegen, Nicholas (1970),“The Entropy Law and the Economic Problem”. Distinguished Lecture Series No. 1, University of Alabama, p.7- 8. 11 Giarini, Orio and Walter Stahel, The Limits to Certainty, Kluwer Academic Publishers, Dordrecht/Boston, 1993, xv. 13 Giarini, Orio and Patrick Liedtke, Op. cit., p. 15. 17 Monetized refers to systems in which money is used for exchange. Non-monetarized refers to systems in which non exchange is conceivable. Unmonetized refers to systems in which exchange takes place without the use of money, as in barter exchange. 18 Giarini, Orio, Dialogue on Wealth and Welfare — a Report to the Club of Rome, Oxford, Pergamon Press, 1980. 19 Hallsmith, Gwendolyn and Bernard Lietaer, Intentional Cities, Intentional Economies. (forthcoming 2010). 20 Korten, David, “Path to a Just and Sustainable New Economy”, Revised and expanded version of a presentation delivered to The EU Club of Rome, Brussels, January 26, 2010. 21 Giarini, Orio, Dialogue on Wealth and Welfare, p. 186. 23 Ulanowicz, R.E., Goerner, S.J., Lieater, B., Gomez, R., 2009, “Quantifying Sustainability: Resilience, Efficiency and the Return of Information Theory”, Ecological Complexity, 6 (1), 27-36 March. 24 Lietaer, Bernard; Robert Ulanowicz; Sally Goerner; and Nadia McClaren: “Is our Monetary Structure a Systemic Cause for Financial Instability: Evidence and Remedies from Nature”, Journal of Future Studies, April 2010. 25 Giarini, Orio, Dialogue on Wealth and Welfare, Club of Rome, 1980. 26 Giarini, Orio and Walter Stahel, The Limits to Certainty, preface by Ilya Prigogine, Kluwer Academic Publishers, Dordrecht /Boston, 1993. 28 Giarini, Orio and Walter Stahel, The Limits to Certainty, preface by Ilya Prigogine, Kluwer Academic Publishers, Dordrecht /Boston, 1993. 29 Giarini, Orio, Dialogue on Wealth and Welfare, p. 202. 31 Maddison, Angus, The World Economy Historical Statistics, OECD, 2003, p.
32 Wilkinson, Richard and Kate Pickett, The Spirit Level, “Why Equality is Better for Everyone”, Penguin Books, 2010 revised edition, first published by Allen Lane 2009. 33 National Intelligence Council, op. cit., p. iv.